A recent report from the US Department of Education stated, “In reflecting on what STEM education should encourage, contributors…described a process of wonder and discovery; playful, hands-on investigation; learning from failure; and an enterprise that allows youth to marry their convictions and enthusiasms with opportunities to grow.” (STEM 2026: A Vision for Innovation in STEM Education, 2016). SAFG wholeheartedly agrees and incorporates these ideas into our afterschool STEM programs, but one area very important to us - something we have been teaching girls since our first class in March 2014 - is that it is okay to make mistakes and even expected! Our teachers not only say this often during class, but the girls use a "Bingo Card" of class objectives where one of the categories they must “cover” to win is “Make a Mistake”. We know that children often get very frustrated if something does not work the first time, and many will give up and think they are not good at something because they did not “get it” the first time around. We remind our students that scientists and engineers sometimes make 100 mistakes before getting something right or work on a project for years before making a breakthrough! This normalizes failure and teaches resilience so they can learn how to bounce back from their mistakes and to learn and grow from them. As Stanford psychologist Carol Dweck stated in her book Mindset, which states that one’s intelligence is either fixed or is fluid and can grow with effort, people with a fixed mindset tend to see errors as signs that they are not good at something and will never be good at that one thing - as if humans are born with natural talents that are beyond their control. However, those with a growth mindset see mistakes as signs they just need to work harder to get better. SAFG teachers encourage growth mindset and teach this is an appropriate developmental part of the learning process. Growth mindset characteristics are key to sticking with math and science. When children are comfortable with making mistakes, they are more willing to take more risks and try new things. In SAFG classes teachers are facilitating opportunities for open-ended discovery with new materials and ideas each week, which means the girls are always exposed to many situations where they are trying something new. When talking to kids about making mistakes, researchers have found it is helpful to ask the child why they think something did not work, not just about the right way to do something. SAFG agrees and does not merely focus on the answers but rather spends more time talking about the steps leading up to the solution. SAFG girls are not only having fun exploring so many fun STEM concepts each week, but are learning that making mistakes is not only okay, but can lead to great discoveries! We will leave you with this article to enjoy. SAFG had a very busy, productive summer. In June we collaborated with Code for Fun to deliver a Product Design with Coding and Craft camp to 3rd - 5th graders from different schools throughout the East Bay at the Emeryville Community Center for Life (ECCL). We also held a camp open to the public called Product Design Using Engineering and Craft for K - 2nd graders also at the ECCL. Role models from Clif Bar, QuanticMind, Bikanta, Lioness and Mookuu visited our campers telling them how they use science and engineering in their jobs. 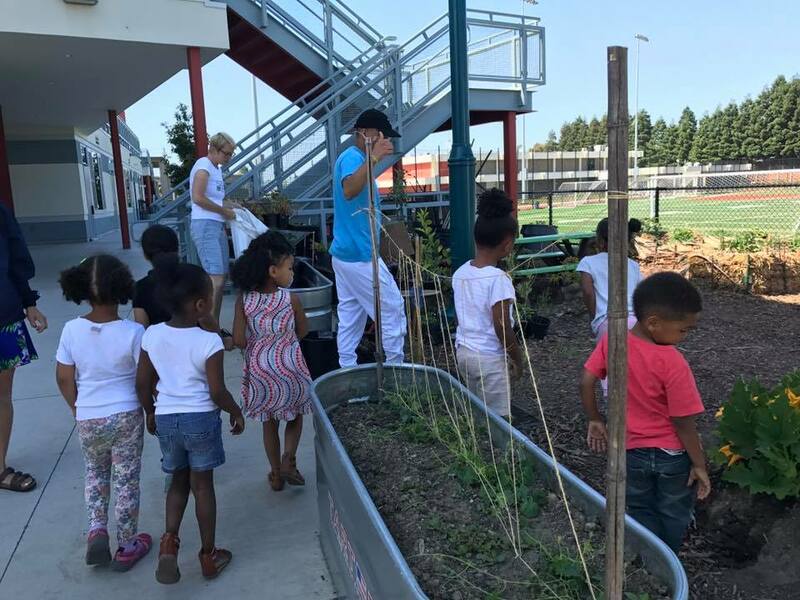 Funded by the Nancy P. and Richard K. Robbins Family Foundation, SAFG collaborated with John Rubio, Superintendent of the Emery Unified School District, and the Emeryville Recreation Department, to offer summer STEM classes to approximately 150 girls and boys in kindergarten through fifth grades over a five-week period. Children were exposed to botany, chemistry, engineering, physics and math through fun, hands-on projects. With support from NXP Semiconductors, SAFG expanded its existing library program to include 29 classes this summer prioritizing enjoyable, meaningful STEM projects that both children and their caregivers could work on together as a family. In collaboration with the Lawrence Hall of Science at UC Berkeley and the Oakland Public Library, SAFG reached approximately 625 girls and boys and their caregivers over a 9-week summer program at seven library branches: Main Library, 81st Avenue, Golden Gate, Easmont Library, Brookfield Library, Elmhurst Library and Rockridge Library. This fall SAFG is offering ten Puzzling Potions classes at six different schools, including a new addition, Jefferson Elementary in Berkeley. Objectives this session include: learning about the different types of chemical reactions; measuring quantities carefully and accurately; and using the scientific method. We are also focusing on 21st century skills and what makes a scientist a scientist? Curious: scientists ask questions to understand how things work. Careful: scientists use care in their work to make sure they understand why something works the way it does. Creative: scientists think outside “the box” to find new ways to answer their questions. Role models from Proterra, Bayer, Dupont, Lawrence Livermore Lab and UC Berkeley are visiting all of our classes demonstrating how chemistry plays a part in their respective jobs and how they are helping the world. Many thanks to all of our role models Kristiina Niemesto, Arianna Kazez, Samantha Sprau, Laura Sofen, Vanessa Yang, Alexandra Ramsey, Christine Saechao and Kari Finstead. SAFG was invited to host a booth at WorldWideWomen's second annual Girls’ Festival on October 1st at The Hive in Oakland. The daylong festival included fun activities, 20+ exhibitors, a maker’s space, workshops, panel discussions, performances, and presentations. Supported by Desmos, SAFG was in the Maker's Space and drew in well over 100 kids to their tangram puzzles and Islamic Pattern making activities, illuminating the connection between math and art. Many thanks to Denis Lantsman, Varshine Chandrakanthan, Samantha Sprau, Sowmya Purushothaman, Ashley Dineen and Cathy Tam for volunteering time to help the kids who visited our booth. SAFG was thrilled to participate in the East Bay Mini Maker Faire at Park Day School in Oakland for a third time, this year providing families the opportunity to make balloon-powered cars with recyclables. Over 150+ kids and their parents stopped by, and SAFG teachers and volunteers encouraged them to use the Engineering Design Process when creating their cars. Many of them showed frustration when their cars didn't move at all or not as fast as they had anticipated. We emphasized the importance of persistence and tried to normalize failure in engineering, encouraging the kids to keep re-designing and re-testing. We are grateful for Jennifer Wales (Desmos), Denis Lantsman (Desmos), Kathy Tam (UC Berkeley), Bela Deshpande (PG&E), Victoria Robbins (PG&E) and Stephany Damaso (PG&E) for volunteering their help so we can give individual attention to the families who participated. Finally, SAFG is happy to announce it is continuing its free STEM Library classes throughout the 2017-2018 school year at the Main Oakland Branch Library (2nd Tuesday of each month) and at 81st Avenue Branch Library (4th Tuesday of each month). Check out our website for more details. SAFG is so happy to announce it just received a generous grant for the second year in a row from the Warriors Community Foundation - we could not be more thrilled to get the continued support from this great organization! SAFG also received its second grant this summer from the Clif Bar Family Foundation. Thank you Warriors and Clif Bar for your continued support in 2017 in helping SAFG reach more girls in the Oakland area! We also look forward to having more female STEM role models from Clif Bar in early 2018 at our new Food Science program. SAFG also wants to thank NOVUS for its continued generous support throughout the year. This support makes it possible for SAFG to continue to expand its programs and build capacity. SAFG will be having a Tuesday Giving "Crowdrise" campaign on November 28, 2017. If you are going to donate to great causes this holiday season we would love your support. Stay tuned for a separate email going out in November. If you would like to donate and support girls in science now, no need to wait till November 28, please go to our website. If your company provides small grants to programs like Scientific Adventures for Girls and would like to sponsor a class, please email ccarr@scientificadventures.org. We would love to apply! Pour vinegar into a bowl and have a scoop or baster ready. Add a few scoops of baking soda inside your pumpkin. Add glitter and food coloring if using. Add a few drops of dish soap if using. Finally, add vinegar and observe! Repeat the process until you run out of baking soda or vinegar. If your girls are currently enrolled in our Puzzling Potions class, they can help explain what is happening, which is a chemical reaction. When the baking soda (base) and vinegar (acid) mix, they react. The reaction is giving off a gas called carbon dioxide which shows up as bubbling fizzing action. What do you hear? See? Smell?